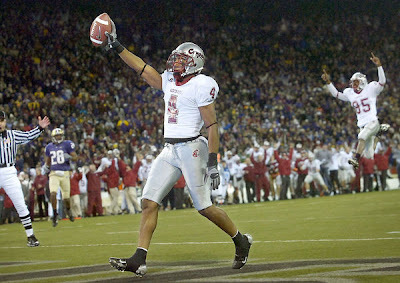 You may remember Brandon Gibson from dominating performances like, oh, I don’t know, the 2007 Apple Cup? Well, Paul Wulff scored his first big win as head coach, as young Mr. Gibson is coming back to Pullman! Well, ok, there’s another side to it. Such as Gibson’s potential draft grade wasn’t as high as he had hoped, so he wants to come back and get better, turn in an outstanding senior year and then go to the next level. So it wasn’t just Wulff’s overwhelming recruiting skills that kept Gibson in the fold. But I’m sure it didn’t hurt. Personally I thought all along that Gibson would go pro, and I even told Brinkhater that last year, that a big year from him could leave things pretty bare for ’08. But man oh man, do they need him next year. Losing Bumpus, Dillon and even Collins from the passing game is going to be a tough blow. But to also lose Gibson, the best WR on the team last year and the only first-team All-Pac-10 pick in Pullman, could have been almost too much to overcome. TE Devin Frischknecht who had a nice Apple Cup (5 catches for 88 yds and 2 TD’s). Daniel Blackledge, a young talented kid from Colorado who saw a little bit of playing time as a frosh. Keith Rosenberg, the slot WR from Bellevue. Anthony Houston, a good sized youngster who hasn’t had much of a chance yet. Greg Walker, a 6-3 redshirt frosh last year who will probably be in the mix. So all things considered, it’s going to be a young group that hasn’t done much on the field, but then again, hasn’t really had a shot with established guys like Bumpus, Dillon, and Collins in front of them. The best news is that Wulff’s offense is clearly WR-friendly! EWU’s Aaron Boyce, just a sophomore last year, hauled in 85 balls for over 1300 yards and 10 TD’s. As a sophomore. WOW. And that was with a sophomore QB at the helm. So if you ask me, Gibson has a chance to put up some insane numbers next year. WE WERE WRONG about McEndoo! Yeah, it happens. Our source said it was solid information, but something must have broken down along the way. The new OL coach has been hired and it’s not a name anyone saw coming. Harold Etheridge comes in from Northern Illinois as a 19-year vet of coaching offensive lines, so he’s been a lot of places and seen a lot of things. Check out the story, as he’s been so many places that we won’t even list them all out here. Still, sounds like a decent hire, but he’s not a guy with WSU roots. Maybe that’s a good thing, I don’t know, but Wulff clearly sees something here. On the offensive side of the ball Todd Sturdy will serve as offensive coordinator and work with quarterbacks; Steve Broussard will be the running backs coach; Mike Levenseller will serve as wide receivers coach; and Rich Rasmussen will serve the duel role of tights ends coach/recruiting coordinator. On the defensive side, Jody Sears will be co-defensive coordinator/cornerbacks coach; Chris Ball will be assistant head coach/co-defensive coordinator/secondary coach; Travis Niekamp will coach linebackers and Malik Roberson will coach the defensive line. Interesting that not only is Ball the secondary coach, but also the co-DC AND assistant head coach? Ball is a really strong hire, and now we can see he’s going to wear a lot of hats. And, well, we don’t know a whole lot about Sears, but I can say that I’ve read a few harsh comments from EWU fans in regards to the defense Sears called at EWU. Let’s just say they weren’t too thrilled, so the idea of having Ball and Sears co-coordinate the D might be a very good thing, at least for next season. Also of note, no Timm Rosenbach. Not a shock, but there was a bit of uncertainty around him initially. Sturdy gets the reins, not only as OC, but as QB coach. I wonder how much impact Levy will have in play-calling this year? OR do we get to fully blame Sturdy for every offensive struggle!?!? I kid. In recruiting, things are definitely heating up. Andrei Lintz, the TE/DE prospect we wrote about a little while ago, gave Wulff a verbal commitment last night. Here’s a link to his profile. Good size and athleticism, he’s got that “upside” that gets everyone excited. There are more visits on the way too, including the 4-star JC defensive end, Grant Valentine, who will show up in Pullman this coming weekend. Valentine, you’ll remember, had that Youtube video where he was just flying all over the field making plays. Here’s a link if you want to watch it again. 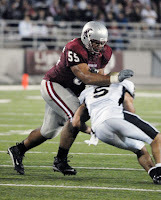 Also, the center who had Hawaii as his leader, Jonathan Solomon, will be in this weekend. Might the June Jones news (he’s OFFICIALLY at SMU now) have an impact on his future? We’ll see. You are currently browsing the archives for the Harold Etheridge category.